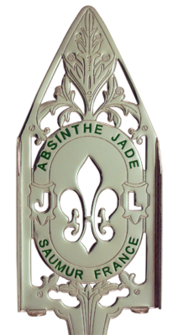 ​Absinthe spoons have been around for over 200 years and yet have remained relatively unchanged since its introduction during the Belle Epoque, the height of absinthe popularity. If you look, you can find an absinthe spoon today just like the one your great, great grandfather used to prepare his absinthe. A common question is “Why buy an absinthe spoon? Can’t you just use a fork in its place?” Now this is really not a bad question. You would certainly have no problem mixing your absinthe with a fork. But we all know that if a true Absintheur saw you using a fork to mix your absinthe, they would seize your liquor, give you a ticket for “Absinthe Abuse” and most likely do that glove slap thing across your face! ​You will need the genuine article to perform the absinthe ritual properly. If you want to do something right, you need the right accessories. Don't look like an amateur by using anything other than the real deal! ​Absinthe Recipes What Else Besides Water? If you have begun to familiarize yourself with Absinthe and absinthe accessories, you know there are many different Absinthe Spoon styles to choose from. Different lengths, finishes and designs are the major considerations. Let's explore these options and why they're important. STANDARD FINISHES - Chrome and Stainless Steel finishes are the most common finish you will find. They are both very durable and long lasting requiring little maintenance. You can wash them in a dishwasher if desired and they will maintain their original appearance for many years. If polishing is required, you can use a polish with the least amount of abrasive. Look for a polish designed for "Silver" as these are the least abrasive. Chrome and Stainless spoons will usually be less expensive. PREMIUM FINISHES - Premium finishes, such as gold and silver, are really quite beautiful. Nothing says class like a gold or silver plated absinthe spoon. Premium plated spoons do however require special care. You must hand wash your Premium Absinthe Spoon meaning no dishwasher. If your premium finish absinthe spoon requires polishing, especially silver, you should always use a non abrasive cleaner to avoid damage to the finish. We suggest using Maas Metal polish first as it has no abrasive properties and will leave a protective finish. If your spoon still needs cleaning, try Tarn-X Silver Glaze as it has a very mild abrasive and will leave a protective coating on the spoon as well. It goes without saying that premium finishes will cost more than a standard spoon. Length is important if you prefer to mix your absinthe after louching. So if you use a tall glass, you will need a longer spoon. Something to note is a long spoon will work for both long and short glasses making it a more versatile choice. Conversely, a short spoon will only reach the bottom of shorter glasses. When using a reservoir glass, a tall, thin spoon makes it easier to reach the bottom of the glass. Lastly, when choosing your spoon the quality of the spoon & intricacy of the design will play a big part in the cost of the spoon. A very intricate design or finely crafted spoon will always cost more than a simple spoon. Remember, not all absinthe pieces are created equal. If you see 2 pieces that look the same but one is more expensive, there is most likely a quality difference. It is like anything else you buy - You get what you pay for. A good rule of thumb is to buy from a reputable seller who has a generous return policy and avoid Amazon and Ebay. Amazon and Ebay have become saturated with poor quality absinthe accessories.